Do the original Star Wars films still hold up today as quality films, or are we riding a wave of nostalgia? Erik answers a listener question about his love of Boba Fett. This week Erik tackles a listener question. What Legends content are you glad to see gone, and what content would you like back? And what content do you think we’ll see brought into canon? There’s a very simple equation for determining success, and it explains why we have a massive rift within the Star Wars fan community every time there’s a new film. No, there was no rift with Rogue One, but the equation explains that too. Lucasfilm will continue to be in a lose-lose situation with each new release, and that will continue until fans can change their perspectives of their own expectations. In this episode, Erik explains how audience members for each new Star Wars are like Luke entering the cave on Dagobah—they’re taking too much in with them. Erik starts out what will end up being a long series of episodes on Star Wars: Episode VIII — The Last Jedi. In this episode, he goes over what he liked and didn’t like, and he reviews the predictions he made prior to the film. WARNING: This episode contains spoilers for The Last Jedi. Something we lacked in The Force Awakens was galactic context. We had very little information about what had transpired since the prior film, and we didn’t understand the state of the galaxy. Will The Last Jedi give us the context we need? 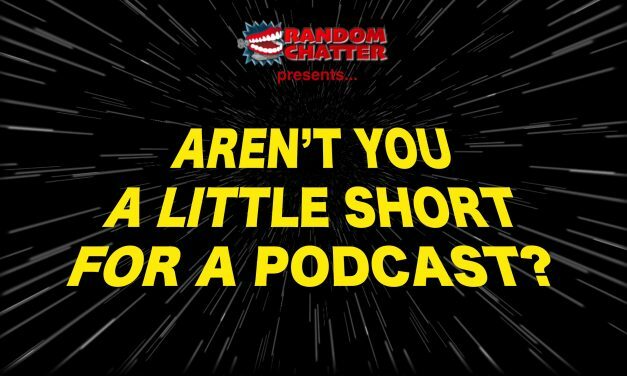 Welcome to the newest microcast on the RandomChatter Network, Aren’t You a Little Short for a Podcast? In this first episode, Erik talks about the importance of strong villains and why we need to learn more about Snoke in The Last Jedi.